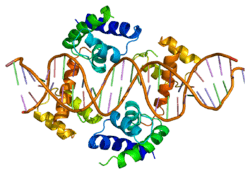 POU domain, class 1, transcription factor 1 (Pit1, growth hormone factor 1), also known as POU1F1, is a transcription factor for growth hormone. Pituitary-specific positive transcription factor 1 has been shown to interact with GATA2 and PITX1. 1 2 "Entrez Gene: POU1F1 POU domain, class 1, transcription factor 1 (Pit1, growth hormone factor 1)". ↑ Szeto DP, Ryan AK, O'Connell SM, Rosenfeld MG (July 1996). "P-OTX: a PIT-1-interacting homeodomain factor expressed during anterior pituitary gland development". Proc. Natl. Acad. Sci. U.S.A. 93 (15): 7706–10. doi:10.1073/pnas.93.15.7706. PMC 38811 . PMID 8755540. Parks JS, Brown MR (1999). "Transcription factors regulating pituitary development". Growth Horm. IGF Res. 9 Suppl B: 2–8; discussion 8–11. doi:10.1016/S1096-6374(99)80074-4. PMID 10549299. Rodriguez R, Andersen B (2003). "Cellular determination in the anterior pituitary gland: PIT-1 and PROP-1 mutations as causes of human combined pituitary hormone deficiency". Minerva Endocrinol. 28 (2): 123–33. PMID 12717343. Quentien MH, Barlier A, Franc JL, Pellegrini I, Brue T, Enjalbert A (2006). "Pituitary transcription factors: from congenital deficiencies to gene therapy". J. Neuroendocrinol. 18 (9): 633–42. doi:10.1111/j.1365-2826.2006.01461.x. PMID 16879162. Cattini PA, Yang X, Jin Y, Detillieux KA (2006). "Regulation of the human growth hormone gene family: possible role for Pit-1 in early stages of pituitary-specific expression and repression". Neuroendocrinology. 83 (3–4): 145–53. doi:10.1159/000095522. PMID 17047377. Li X, Giachelli CM (2007). "Sodium-dependent phosphate cotransporters and vascular calcification". Curr. Opin. Nephrol. Hypertens. 16 (4): 325–8. doi:10.1097/MNH.0b013e3281c55ef1. PMID 17565274. Tatsumi K, Miyai K, Notomi T, Kaibe K, Amino N, Mizuno Y, Kohno H (1993). "Cretinism with combined hormone deficiency caused by a mutation in the PIT1 gene". Nat. Genet. 1 (1): 56–8. doi:10.1038/ng0492-56. PMID 1302000. Tatsumi K, Notomi T, Amino N, Miyai K (1992). "Nucleotide sequence of the complementary DNA for human Pit-1/GHF-1". Biochim. Biophys. Acta. 1129 (2): 231–4. doi:10.1016/0167-4781(92)90494-k. PMID 1370379. Ohta K, Nobukuni Y, Mitsubuchi H, Fujimoto S, Matsuo N, Inagaki H, Endo F, Matsuda I (1993). "Mutations in the Pit-1 gene in children with combined pituitary hormone deficiency". Biochem. Biophys. Res. Commun. 189 (2): 851–5. doi:10.1016/0006-291X(92)92281-2. PMID 1472057. Ohta K, Nobukuni Y, Mitsubuchi H, Ohta T, Tohma T, Jinno Y, Endo F, Matsuda I (1993). "Characterization of the gene encoding human pituitary-specific transcription factor, Pit-1". Gene. 122 (2): 387–8. doi:10.1016/0378-1119(92)90234-G. PMID 1487156. Radovick S, Nations M, Du Y, Berg LA, Weintraub BD, Wondisford FE (1992). "A mutation in the POU-homeodomain of Pit-1 responsible for combined pituitary hormone deficiency". Science. 257 (5073): 1115–8. doi:10.1126/science.257.5073.1115. PMID 1509262. Pfäffle RW, DiMattia GE, Parks JS, Brown MR, Wit JM, Jansen M, Van der Nat H, Van den Brande JL, Rosenfeld MG, Ingraham HA (1992). "Mutation of the POU-specific domain of Pit-1 and hypopituitarism without pituitary hypoplasia". Science. 257 (5073): 1118–21. doi:10.1126/science.257.5073.1118. PMID 1509263. Lew AM, Elsholtz HP (1991). "Cloning of the human cDNA for transcription factor Pit-1". Nucleic Acids Res. 19 (22): 6329. doi:10.1093/nar/19.22.6329. PMC 329149 . PMID 1956794. He X, Treacy MN, Simmons DM, Ingraham HA, Swanson LW, Rosenfeld MG (1989). "Expression of a large family of POU-domain regulatory genes in mammalian brain development". Nature. 340 (6228): 35–41. doi:10.1038/340035a0. PMID 2739723. Bodner M, Castrillo JL, Theill LE, Deerinck T, Ellisman M, Karin M (1988). "The pituitary-specific transcription factor GHF-1 is a homeobox-containing protein". Cell. 55 (3): 505–18. doi:10.1016/0092-8674(88)90037-2. PMID 2902927. Herr W, Sturm RA, Clerc RG, Corcoran LM, Baltimore D, Sharp PA, Ingraham HA, Rosenfeld MG, Finney M, Ruvkun G (1989). "The POU domain: a large conserved region in the mammalian pit-1, oct-1, oct-2, and Caenorhabditis elegans unc-86 gene products". Genes Dev. 2 (12A): 1513–6. doi:10.1101/gad.2.12a.1513. PMID 3215510.
de Zegher F, Pernasetti F, Vanhole C, Devlieger H, Van den Berghe G, Martial JA (1995). "The prenatal role of thyroid hormone evidenced by fetomaternal Pit-1 deficiency". J. Clin. Endocrinol. Metab. 80 (11): 3127–30. doi:10.1210/jc.80.11.3127. PMID 7593413. Bamberger AM, Bamberger CM, Pu LP, Puy LA, Loh YP, Asa SL (1995). "Expression of pit-1 messenger ribonucleic acid and protein in the human placenta". J. Clin. Endocrinol. Metab. 80 (7): 2021–6. doi:10.1210/jc.80.7.2021. PMID 7608249. Irie Y, Tatsumi K, Ogawa M, Kamijo T, Preeyasombat C, Suprasongsin C, Amino N (1995). "A novel E250X mutation of the PIT1 gene in a patient with combined pituitary hormone deficiency". Endocr. J. 42 (3): 351–4. doi:10.1507/endocrj.42.351. PMID 7670563. Delhase M, Vila V, Hooghe-Peters EL, Castrillo JL (1995). "A novel pituitary transcription factor is produced by alternative splicing of the human GHF-1/PIT-1 gene". Gene. 155 (2): 273–5. doi:10.1016/0378-1119(94)00757-J. PMID 7721104. Okamoto N, Wada Y, Ida S, Koga R, Ozono K, Chiyo H, Hayashi A, Tatsumi K (1995). "Monoallelic expression of normal mRNA in the PIT1 mutation heterozygotes with normal phenotype and biallelic expression in the abnormal phenotype". Hum. Mol. Genet. 3 (9): 1565–8. doi:10.1093/hmg/3.9.1565. PMID 7833912.